It was the reveal just about everyone was waiting for at the 2018 Los Angeles International Auto Show. What was by far one of the worst kept secrets in the entire industry over the past twelve months, the 2020 Jeep Gladiator made its official debut at the 2018 LA Auto Show early last week. Jeep’s new mid-size pickup truck is the first product of its kind from FCA since the Dakota was mercilessly killed back in 2011, and the brand’s first foray into the mid-size truck market since the early ’90s is proof positive that a segment which was left for dead just a few short years ago, is well and truly back. As sibling to the newly introduced JL Wrangler, the Jeep Gladiator boasts FCA’s 3.6-liter Pentastar V-6 that produces 285 horsepower and 260 pound-feet of torque, and helps it make claims to being one of the segment’s most capable offerings. Out of the box the Keep Gladiator already sits at or near the top of the segment in terms of carrying capability and off-road readiness, but how does it compare to segment’s current king of the dirt, the Colorado ZR2? As far as truck things are concerned, the 7,650 lb towing capacity of the Jeep Gladiator is most in class, and its 1,600-lb 4×4 payload capacity sits second to the new Ford Ranger, which tops it by a mere 50 lbs. The regular Chevrolet Colorado is rated to tug 7,000 lbs, with a 1,532 lb payload rating, but the Colorado ZR2 sees its numbers fall to 5,000 lbs trailering, and 1,100 lbs payload because of the ZR2’s two-inch lift and special Multimatic DSSV suspension. On the off-road front, the Gladiator is also packing heavy heat. It shares the Wrangler’s Command-Trac and Rock-Trac four-wheel-drive systems, Dana 44 axles, electric front- and rear-axle lockers, a limited-slip differential and electronic sway-bar disconnect. It has 10 inches of ground clearance, a 40.8-inch approach angle, a 25-inch departure angle; the Rubicon version ups those figures to 11.1 inches of clearance, a 43.4 approach angle, and 26 inches for departure. The Colorado ZR2 answers with its DSSV dampers, front and rear electronic lockers, 3.5-inch wider track, and aluminum skid plates. It can only manage 8.9-inches of ground clearance, a 30-inch approach angle, and 23.5-inches of departure space. The longer Gladiator does lose to the ZR1 in terms of breakover angle, with the ZR2’s 23.5 handedly beating the Jeep’s 18.4 inches, and the Rubicon’s 20.3-inch figure. What we don’t know for sure is the price. The Chevrolet Colorado ZR2 is not exactly a budget buy, at just over $41,000. 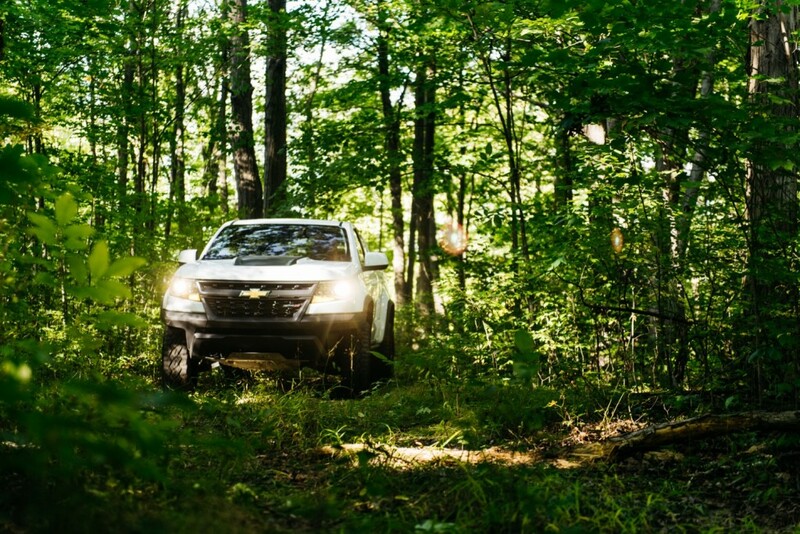 A AEV-outfitted Chevrolet Colorado ZR2 Bison can easily break $50,000. Rumors have swirled that a Jeep Gladiator Rubicon could also be over $50,000, and when looking at what kind of money a loaded JL Wrangler demands, that doesn’t seem too off base. For more off-road truck content, we recently drove the 2019 Chevrolet Colorado ZR2 Bison. Check back on Wednesday for our first impressions. They both hold advantages and drawbacks. Most Jeep buyers will come from the Wrangler. The Jeep is nice but not for everyone. It’s a Jeep thing. Seeing as how GM’s main source of income will be mostly pickups and SUV., they had better step up their game and make them all class leading. If you are going to put all your eggs in one basket you can’t fill them with rotten eggs. Unmistakable design in a sea of vanilla, and kudos for keeping that manual transmission alive, but this new Scrambler is still best left to true off road aficionados. Heard good things about improvements in on road handling (where 99.9% of driving does occur), but wouldn’t expect miracles within the confines of that solid front axle setup. I love the manual option. I hope GM takes notice and offers manual on 3.6 and 2.8 and not just the 2.4. If everything is and will be trucks, there should be a truck in every category. Bring back S10 sized truck and Blazer. Rear and awd. Amen! GM needs to bring back a rear wheel drive mid size and NOT a crossover style “truck”. With FCA upping the game with solid Dana axles front and rear, Gm is missing the boat (again) on the growing truck market. They don’t need a 1970’s style Blazer, but they need to compete. If they are going the “Truck” route, they need to build trucks, not crossover crap. Just sayin’. Are you saying the Colorado is a crossover? Unless they changed something in the last couple of days the Colorado is still a midsized rear wheel drive Truck. Jeep will dominate midsized trucks. They need a bland body style Dakota for RAM, too. The new Ram 1500 is probably the best Big Three truck and sales will surge but never overtake GM. GM gets more boring by the year while Sergio’s FCA becomes more impressive. I only hope that Jeep doesn’t do a faux trail worthy Blazer wannabe besides Compass.